The purpose of this Request for Proposals (RFP) is to solicit proposals for professional conference speakers for the upcoming NCCIA Annual Conference. Conference speakers must be willing to provide their services pro bono basis (without expectation of payment) for the captive insurance profession and in support of the Mission of NCCIA below. Presenters selected through this proposal process can expect a wide range of exposure before conference attendees and are welcome to attend all conference activities, including meals/receptions at a reduced conference registration. 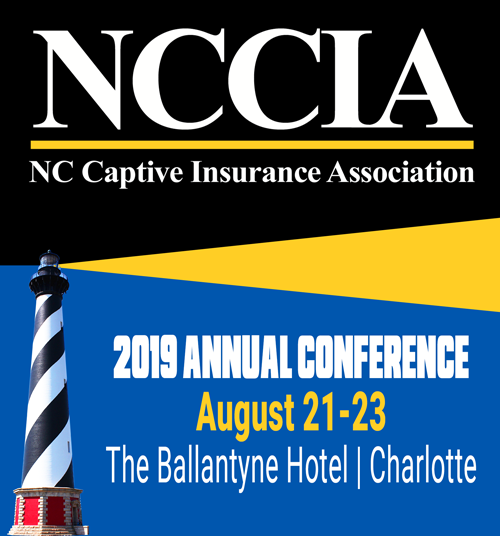 The NCCIA Captive Insurance Association is the voice of the private sector driving sustainable growth and success of the captive insurance industry in North Carolina. Conference attendance is expected to be in excess of 200 insurance industry professionals, with most attendees participating for professional development workshops and networking opportunities. Attendees represent a variety of participants in the captive insurance enterprise, captive managers, actuaries, attorneys CPAs and investment advisors to name a few. Attendees hold middle management or executive level positions within companies or are entrepreneurs. The 2019 Conference will be held at the Ballantyne Hotel, located approximately 30 minutes from the Charlotte’s Douglass Airport. The conference atmosphere is designed to be one of fun and learning in a business casual environment, with numerous opportunities for professional development and networking. The Conference will feature a variety of learning formats, including concurrent breakout sessions, a general session keynote address, and an exhibitor area featuring event sponsors and other supporters of the captive insurance industry. RFPs are due by email no later than 4:30 (EST) on Friday, March 15, 2019. There are two options for submitting your proposal below. Complete the online form or download and complete the Proposal Form Document. Proposals are for panels of up to 3 individuals. Preference is given to panels that include owners of captive insurance companies. Presenters may submit as many proposals as they like, but each topic must be submitted separately to allow for a fair and efficient evaluation of all topic submissions. Proposals submitted will become property of the NCCIA and will not be returned. All presenters who made proposals will be notified of the results of this solicitation. It is expected that if you are selected as a professional presenter, you will honor your commitment to speak at the conference. NCCIA Conference breakout sessions and speaking opportunities ae available as follows. Presenters may submit proposals for any or all of the services requested, by submitting separate RFPs. Presenters are expected to provide conference materials in advance of the conference so that they may be loaded onto the conference app prior to the conference. The deadline for conference materials is July 12th. Presenters are expected to limit their presentations to the allotted time. Presentations are expected to be interactive with attendees wherever possible. It is the goal of the conference committee to provide conference attendees with the most current and innovative information available. Session submissions should be designed to meet this goal. Marketing of a specific organization or “sales pitches” are not allowed in any conference sessions. The Annual Conference Committee has discussed a number of potential topics for panels at the conference. A list of those topics is below. Additionally, the committee encourages the submission of other items that you believe would be of interest to our attendees. Those items will be given equal consideration to the items below. After the items for inclusion in the conference are selected, an Annual Conference Committee member will be assigned to work with the panel on the details of the panel and final submission of conference materials.